I'm trying to choose which one to cut open. Anybody have any opinion on these? I'm sure they're all junk. Especially the Radio Shack one. They were the kings of making stuff cheap. 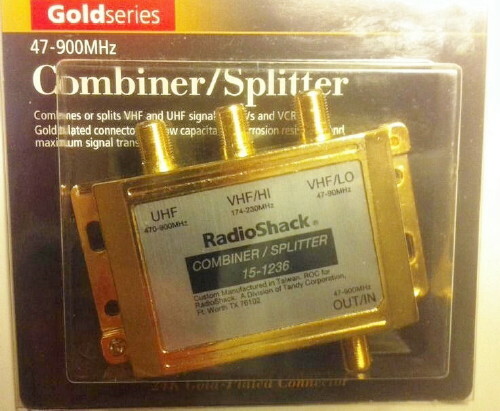 Some of The Radio Shack parts are very poor quality, but their gold series devices are quite good. 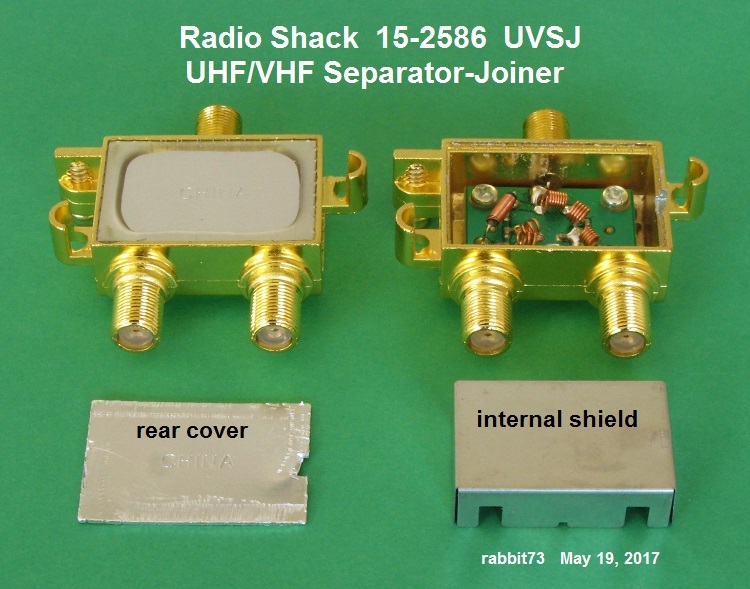 In particular, I like the RS 15-2586 UVSJ and the RS 15-1236. The 15-1236 is a unique device. It combines a UHF antenna, VHF-High antenna, and a VHF-Low antenna. It can be considered as a UVSJ and a HLSJ in one housing. Last edited by rabbit73; 04-06-2019 at 09:32 AM.. I don't recall measuring the insertion loss of splitters, but I did measure the insertion loss of UVSJs. Great testing on the UVSJ's. Oh, I thought you had tested Splitters/Combiners. My mistake. Do you recall some other members testing them? I read somewhere, the Perfect Vision and Macom were the best as far as being lower loss. Last edited by Chiwaukee OTA; 04-08-2019 at 06:35 AM.. I remember those days...The Gold Series. I thought it was just great marketing. I see now. The internals were good. Would this be considered a "low loss" or "lower loss"splitter?? Last edited by Chiwaukee OTA; 04-09-2019 at 05:53 AM..
RG-223U is RG-8 ?? Didn't know! RG-223U has standard copper braid, RG-224U has silver plating, RG-224U is also .02 inches thicker due to it having double braided shielding, and makes it a bit tougher to get into a PL259 connector. 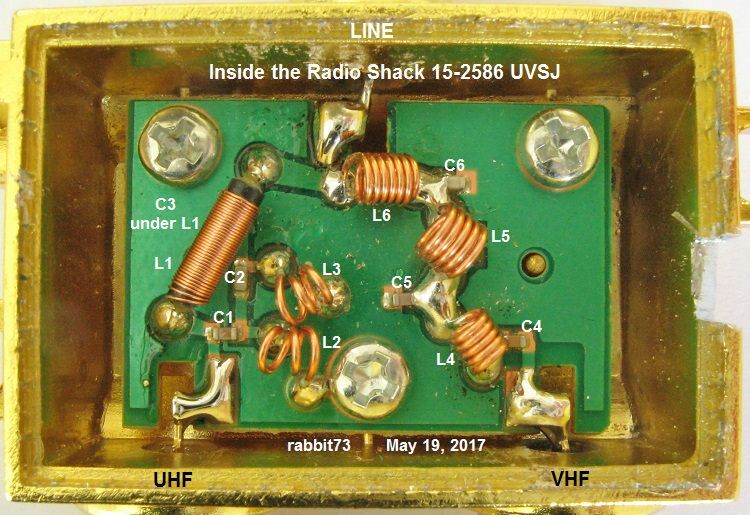 RG-223U is commonly called RG-8 coax, and any ham radio supply should have it, it also has a twisted 7 conductor center conductor. Another coax to consider is RG-8X, (same size as the 75 ohm RG-6) it is smaller but has a solid copper center conductor and shield. Do not use the 9914 type of RG-8 as it has an aluminum foil and braid shield. And due to the silver plated conductors RG-224 is quite expensive, some places also offer the coax in standard copper conductors, this will drop the price. The last time I bought some RG-224U the cost was around $4 a foot. Is there a formula for the length of the 50 Ohm cable to tune it to two antennas combined? What would happen if you had a combo antenna? I mean like a UHF / VHF High antenna you probably couldn't do that right? I guess in other words, how did Calveras arrive at the length of his RG? Last edited by Chiwaukee OTA; 04-08-2019 at 06:38 AM.. The stub is usually a quarter-wave length of the frequency involved, so on a wide band antenna like TV antennas you would use the middle of the band, find the full wavelength and divide by 4. That would normally be from 470 to 890 MHz, (for now) so 890 - 470= 420, divided by 2= 210, 210 + 470= 680 MHz. Full wavelength of 680 MHz is 17.3571 inches, divided by 4 gives you 4.3392 inches, 4.3392 inches in decimal converted to fractions gives you a stub at 4 11/32 inches. Now combining two 300 ohm wide band balanced output antennas like TV antennas buy just soldering the down leads from two 75 ohm unbalanced baulin's, and stubbing them out with a center frequency stub, will work OK for any channels at the center frequency of the band, but not too good two or three channels on either side of center. 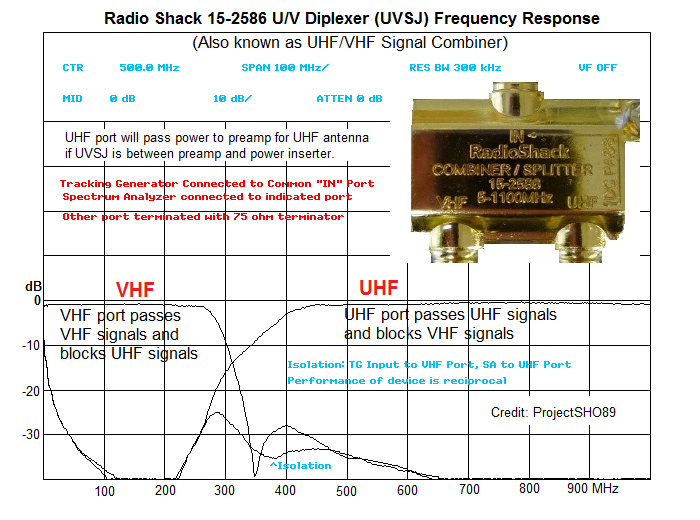 TV antennas are of a wide band design, most resonate at many different frequency's, all depending on the length of the 1/4 wave stubs of the front and back directors, technically they are a 1/4 wave, 300 ohm inductance, balanced output, log-periodic yagi, a very complicated design to try and combine to one feed. Trying to combine them with consumer grade splitters would/could be a big hair loss protect, or "how many times does it get thrown against the wall". When we setup a MATV system (many antennas into one feed) we used commercial channel combiners, each one was customized to each antenna used, we also used one antenna for each channel, each antenna was tuned to a specific channel, then run down to the channel combiner. All this with RF test and measurement instruments not available to most. Preamp identical antennas each before joining? Terry, thank you for that great explanation. There's a lot of knowledge to be gleaned from that post. I'm going to have to read it a couple more times though. I'm now at the hobby stage. And this is where I would like to expand my knowledge. I have good feeds going into my house now and I would like to try a little DX'ing. Thanks to guys like you, rabbit, and so many others here I'm beginning to get the concept. But not having made a living in the industry it's all foreign to me. But I'm glad I'm still able to learn. Thanks for providing the math too by the way. By the way if you or anybody else wants to answer this question, I've read it already but what is the problem with pre amping your signals onto each same exact antennas pointing in the same direction? From a Layman's point of view it would seem like the right solution. But from what I read the noise created by the amps negates the gain. True, or is there more to it than that? Last edited by Chiwaukee OTA; 04-08-2019 at 02:33 PM.. When you are calculating the length of a 1/4 wave matching transformer or a 1/4 wave stub, you must allow for the velocity factor of the coax because the waves travel more slowly in the coax than in free space. This makes the actual physical length shorter than the free space length. How much shorter depends upon the dielectric insulation between the center conductor and the shield. This is called the Velocity Factor. For coax with a solid polyethylene dielectric, the VF is about 66% (0.66), for foam polyethylene dielectric, about 80% (0.80). Using the above calculator for 600 MHz and VF of 0.66, I get 0.27 feet = 3.24 inches which is pretty close to the 3.3 inches by Calaveras. When you are selecting the coax for a 1/4 wave matching transformer, you must consider what connector you will be using on the end of the coax. RG8 coax, with a diameter of 0.405", seems a little too big for an F male connector. Last edited by rabbit73; 04-09-2019 at 07:34 AM.. Anybody familiar with these Channel Master Selectenna Model 0001 HI-LO Couplers? I just picked a few NOS units up for virtually nothing. They look like they might be interesting to experiment with. It like to find one to play around with. Has anyone tested or tried one of these hummers??? For the price it should be a good one. I doubt that it's actually worth $20. So, who makes the best (lowest loss) splitter/combiner ?? So, I resigned myself to the Winegard CC - 7870, only because it's weatherproof and I bought it several years ago before I did all my research. So, as far as regular off-the-shelf splitters, does anybody recommend one over the other? I found this test from many many years ago and most of the splitters are not available I think. He highly recommended the Perfect Vision for all but one or two channels but I searched for it and it's no longer available to the Layman. Tom Ballister has made some interesting and valuable tests that he has reported on his site, but I think the combiner tests that he has made are for splitters that are used in reverse as a combiner for two identical antennas aimed in the same direction for additional gain. 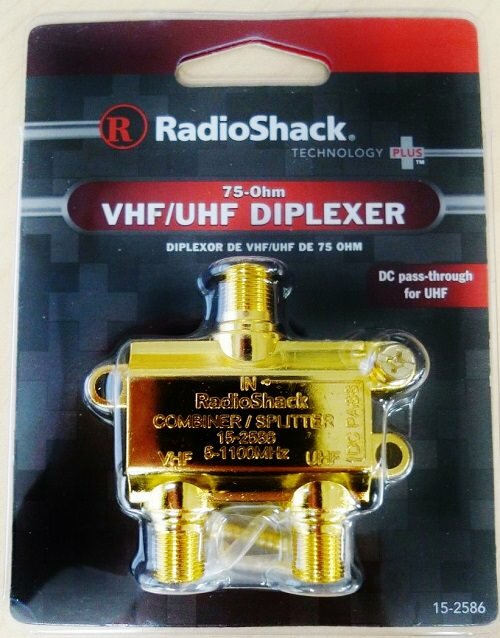 Correct me if I'm wrong, but I think you are more interested in a splitter in reverse used as a combiner for two antennas aimed in different directions. If that is true, the small differences in the internal loss of various splitters is not as important as the large phase difference in signals from two antennas aimed in different directions. The coax lines from each antenna must be the same length when the two identical antennas are aimed in the same direction for additional gain, but the two coax lines do not have to be the same length when the two antennas are aimed in different directions. 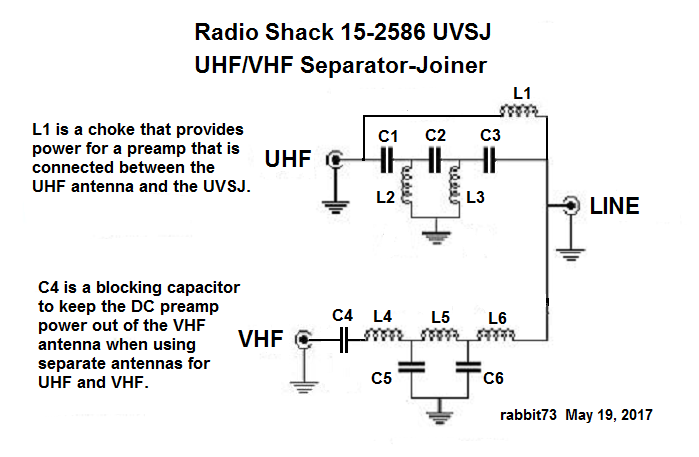 However, as the antennahacks tests show, certain coax lengths will harm certain channels. This is the main problem with using a splitter in reverse as a combiner for two antennas aimed in different directions. It is possible to change the length of one coax line to improve that channel, but then other channels will be harmed instead; it's like a dog chasing its own tail. Last edited by rabbit73; 04-19-2019 at 11:57 AM..
Can bi-directional antennas point in the same direction? I decided to try this bi-directional antenna and then two. And finally combine them with a CC7870 and finally pre-amp them with the LNA 200. I'm going to create another thread about my experiments. I won't even call it trial and error because it was mostly successful and still is I am currently using that as my all TV setup. in other words, all the TVs in the house are running off of the two C4MAX's. My best channel scan so far has been 99 channels. Most of those channels are usable but several of them are highly pixelated or the TV signal meter shows them on the other side of the digital cliff. I'm mostly satisfied, but I'm still trying to squeeze more out of it. I was kind of disappointed when I was watching PBS 36 - 1 out of Milwaukee, I would get the occasional signal pixelation. I do like my educational and science TV. I'm mostly concerned about combining losses, AND I have heard the CC7870 is one of the worst combiners for signal loss, and then of course the noise factor of the LNA 200, that's why you see my questions about combiners and preamps here and the other forum. basically I'm gathering knowledge. I had to slow down on the project for a couple weeks due to the weather and time considerations. I wanted to get it all squared away before the maple to the south leafs out. I probably have about another week. I'm probably going to post all my testing on my "Ganging Antennas" thread. As you remember I was trying to find the bi-directional solution there. My original idea was to get two CM4228 HDs and set them up without the reflectors, keeping in mind they are a very good antenna with the reflector and I could always put those on, but I figured these two would have less of a windload. So, there you have it. You are the first that I have addressed on this new set up. I'm going to squeeze it for all it's worth. Last edited by Chiwaukee OTA; Today at 07:17 PM..